Do you take a “standalone” approach to your organization’s website or consider it an integrated extension of your overall marketing strategy? For many small- and mid-sized organizations that have engaged traditional marketing including print, direct mail and trade shows, the web is a relatively new medium. Lack of knowledge regarding the importance of having an effective web presence oftentimes leads organizations to view their websites as a simple digital business card. If you build a website with that objective, the result will be a great place for someone who already knows about your company and service to get your contact information. If, instead, you take the time to link your marketing objectives to your web design, the result will be a powerful marketing tool. Purely Branded is an integrated branding, marketing and web design company. We primarily service small- to mid-sized organizations through various stages in their development. Start-up organizations needing our full line of services come to us for everything from branding to web design to social media and marketing. While established companies may look to re-brand or re-design their existing website. Regardless of the scope of work, we believe one of the things that separates us from other web design companies is our approach. As we lead clients through our proven process we take into account a company’s overall objectives and develop a purposeful strategy that is implemented across all of the organization’s communications. We make sure we outline a company’s marketing objectives first and use them as our guide as we develop information architecture and wire frames. By identifying critical components and marketing initiatives first, we eliminate the need for re-designs or “patching on” elements of the website at a later stage. While the initial process is more involved than the one used in the traditional web-design-only approach, we believe it’s a crucial part of a successful website design. Each element used in the website design must be consistent with and support the priorities of the organization. From social media, to blog posts, to corporate videos and testimonials, every component must be accounted for, correctly weighed and allocated the appropriate real estate in the design. Whether your marketing objectives are awareness, lead generation, sales or education, it’s important to consider their integration with your website design. Much time and effort goes into directing an organization’s target audience to the website and it’s critical that their destination supports said marketing objectives. Beyond simple aesthetics, a concentrated effort must be made to ensure the organization’s priorities are reflected in it’s web presence. For maximum results, make sure you discuss these issues with your choice of branding or web design company before you begin any web-related project. 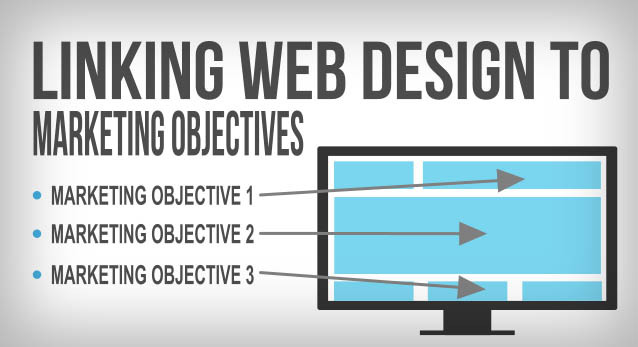 Do you currently link your marketing objectives to your web design? What do you think are the best ways to accomplish this?